The newly plotted moons of Jupiter include one “oddball” that orbits in the wrong direction and may be the remnant of a head-on collision. Jupiter’s tally of moons just got a little bit larger. A team of astronomers announced today the discovery of 10 additional moons orbiting the largest planet in our solar system, raising Jupiter’s moon total to 79. The same survey that discovered these 10 also resurveyed two other moons previously discovered by the researchers, who verified the moons’ orbital paths. Of the 12 newly surveyed moons, 11 have orbits that fall neatly in line with previously discovered satellites. Two of those are part of Jupiter’s group of inner prograde moons, meaning that they orbit in the same direction as the planet rotates. 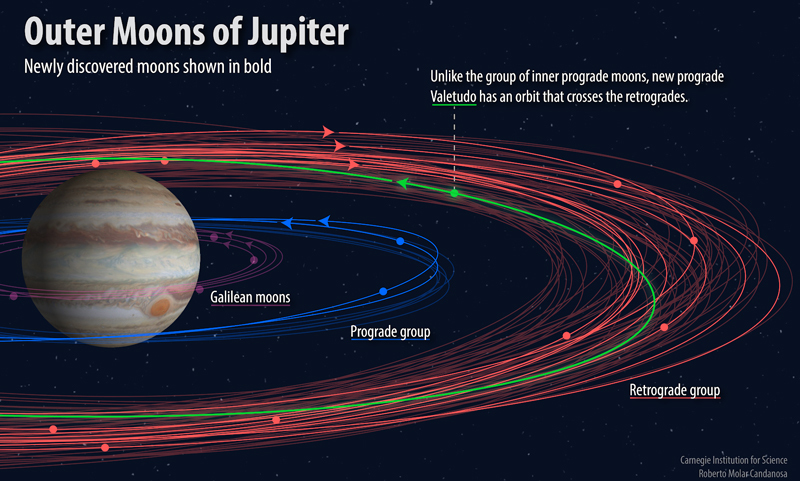 Nine others orbit with Jupiter’s outer retrograde moons in the opposite direction. The twelfth moon, however, is rather peculiar. “Our other discovery is a real oddball and has an orbit like no other known Jovian moon,” said Scott Sheppard, lead scientist on the project and a staff scientist at the Department of Terrestrial Magnetism in Washington, D. C.
This twelfth moon has a wide, 1.5-Earth-year orbit around Jupiter and travels among the retrograde moons. What makes it odd, however, is its maverick orbit: it is the only prograde Jovian satellite discovered to date to orbit at the same distances as the retrograde moons. The moon, tentatively named Valetudo, also has a more inclined orbit than other prograde moons and is one of the smallest moons of Jupiter discovered to date, measuring less than 1 kilometer in diameter. The team first observed the new moons in 2017 with the 4-meter Blanco telescope at Cerro Tololo Inter-American Observatory in Chile. They then used telescopes in Chile, Arizona, and Hawaii to confirm the existence of the moons and their orbits around Jupiter, a process that required many follow-up observations over the past year. The astronomers were not intentionally searching for new Jovian moons when they began observing. They had set their sights on the outer solar system and were looking for more evidence of the elusive Planet Nine, a predicted but as yet unobserved large outer solar system planet. The 2 new regular prograde moons join 15 other previously discovered prograde satellites that typically orbit Jupiter in about an Earth year or less. These moons include the famous Galileans: Io, Europa, Ganymede, and Callisto. They also include a cluster of moons beyond Callisto, shown in blue in the image above. The 7 new retrograde moons join 45 other satellites that take 2–3 years to orbit. The orbits of 9 other small Jovian moons are yet unknown. Astronomers suspect that the retrograde moons may be the remains of larger moons that were destroyed in head-on collisions with prograde objects. Valetudo might be a shattered remnant of one such prograde collider. Because the new moons are a few kilometers in size, the team thinks that the impacts that created the satellites likely took place after the era of planet formation ended. If the collisions had happened earlier, the moons would likely have interacted with dust and gas leftover from forming Jupiter and been dragged into the planet. Also, if the moons had formed earlier, there likely would have been more crashes, the team explained. “This is an unstable situation,” said Sheppard. “Head-on collisions would quickly break apart and grind the objects down to dust.” Given the moons’ stable orbits and kilometer-scale sizes, the collisions were likely chance events later in the solar system’s history. Studying these objects in depth will help astronomers learn about the evolution of the early solar system and the complex Jupiter system. That’s why it helps to find objects that don’t quite blend in, the researchers note—the “oddballs” are what end up painting the fullest picture. Citation: Cartier, K. M. S. (2018), Ten new moons discovered around Jupiter, Eos, 99, https://doi.org/10.1029/2018EO102807. Published on 17 July 2018.